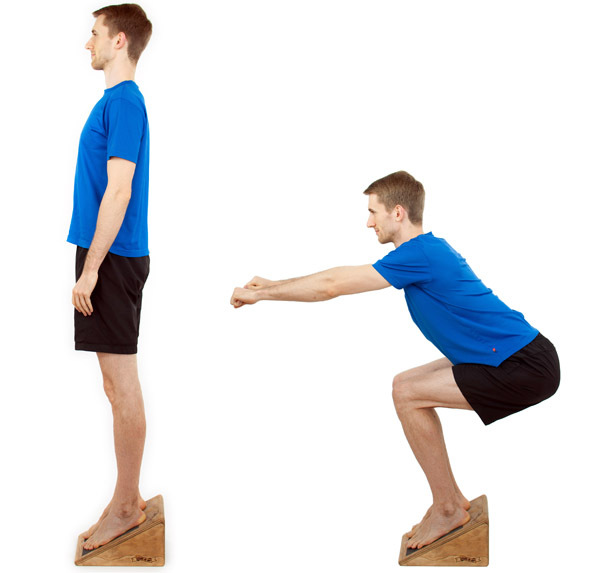 … eccentric squats on a slanted board. 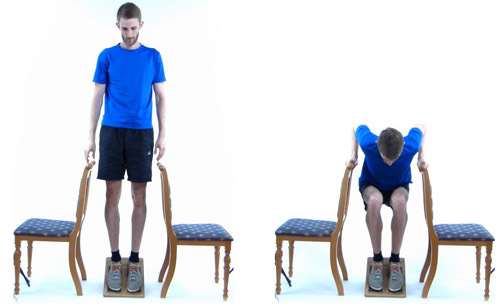 To do this exercise, you need a slanted board and if you have patellar tendonitis in both knees, you need two chairs. We’ll take a look at that variation later. First, here’s how you do eccentric squats if you have patellar tendonitis in one knee. To start out, step on the board with your feet parallel and pointed forward. Next, sit back with your hips, as if you’re reaching for a chair that is behind you. Your knees should be tracking over your toes. Don’t let your knees collapse inward or move too far out to the side. On the way down, place more weight on your injured leg and lower yourself very slowly. Take around 3 to 5 seconds on the way down. Once you’ve reached parallel, stop gently, and shift most of your weight to your healthy leg. Your goal is to avoid any bouncing as that stores energy inside your patellar tendon, which can aggravate your tendonitis. Without bouncing, reverse the movement and get up again taking around 3 to 5 seconds. Squeeze your buttocks muscles hard when you reach the top. Repeat these steps for the number of repetitions you want to do. Before we get to how you should use this exercise in your training, let’s look at how you can adapt it if you have patellar tendonitis in both knees. You will need a way to help yourself up again without loading your knees, so place some chairs or other pieces of furniture on the side of the board. Now, step on the board with your feet parallel and pointed forward. Distribute your weight evenly on both legs. Next, sit back with your hips, as if you’re reaching for a chair that is behind you. Remember: your knees should be tracking over your toes. Don’t let them collapse inward or move too far out to the side. Take around 3 to 5 seconds on the way down. Once you’ve reached parallel, stop gently. In the beginning, use your supporting objects to help yourself up again. Place as little weight on your legs as possible. Once your knees have gotten stronger, you can stand up without these aids. To do so, reverse the movement gently and take 3 to 5 seconds to get up. Avoid using any momentum and squeeze your buttocks muscles at the top. To use eccentric squats successfully for patellar tendonitis, you need to remember these two rules. Execute the exercise slowly. When in doubt, move even slower. The same applies for increasing your repetition numbers from week to week. Tendons are notorious for taking a long time to heal and if you don’t respect this fact, your knees won’t heal at all, so increase your volume slowly. 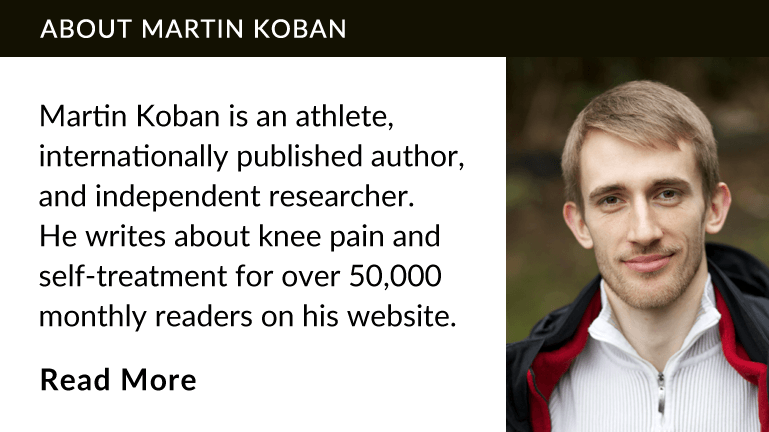 In my book Beating Patellar Tendonitis, I recommend using a journal to track your training and your pain scores. Start your eccentric training with a modest weekly volume such as 3 sessions per week and 3 sets of 15 repetitions per session. Adjust your training based on your pain levels. Rule #2: know the limitations of eccentric squats. Patellar tendonitis is an overuse injury of your patellar tendon. This overuse happens as a combination of too much exercise and biomechanical problems in your body. As an analogy, imagine you’re driving a car and one of its tires is slightly turned in. You can repair that tire all you want, but as long as you don’t fix the mechanical problem with the alignment, the tire will continue to be overused. The same happens to your patellar tendon if you don’t fix biomechanical problems in your body. 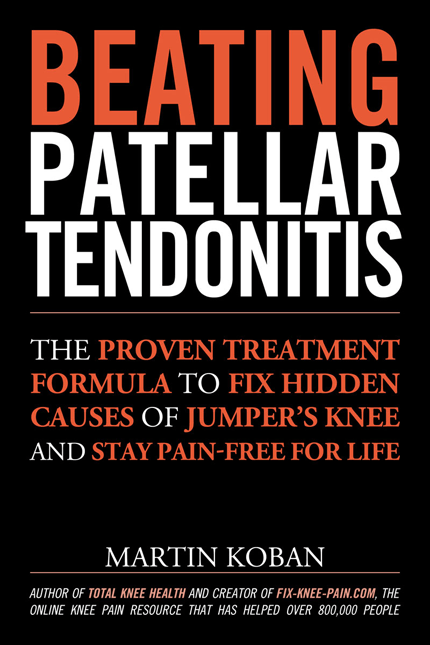 To learn more about these hidden problems, join my free email course on patellar tendonitis. I will show you great exercise to fix those problems and other techniques that will help you get rid of your pain. Lastly, if you know someone with patellar tendonitis, help them get rid of this injury by sharing the link to this video. Alfredson, H.; Pietilä, T.; Jonsson, P.; Lorentzon, R. (1998): Heavy-load eccentric calf muscle training for the treatment of chronic Achilles tendinosis. In Am J Sports Med 26 (3), pp. 360–366. Andres, Brett M.; Murrell, George A. C. (2008): Treatment of tendinopathy: what works, what does not, and what is on the horizon. In Clin. Orthop. Relat. Res. 466 (7), pp. 1539–1554. DOI: 10.1007/s11999-008-0260-1. Jonsson, P. (2005): Superior results with eccentric compared to concentric quadriceps training in patients with jumper’s knee: a prospective randomised study. In British Journal of Sports Medicine 39 (11), pp. 847–850. DOI: 10.1136/bjsm.2005.018630. Purdam, C. R. (2004): A pilot study of the eccentric decline squat in the management of painful chronic patellar tendinopathy. In British Journal of Sports Medicine 38 (4), pp. 395–397. DOI: 10.1136/bjsm.2003.000053. Tan, Suan Cheng; Chan, Otto (2008): Achilles and patellar tendinopathy: Current understanding of pathophysiology and management. In Disabil Rehabil 30 (20-22), pp. 1608–1615. DOI: 10.1080/09638280701792268. van Usen, Carla; Pumberger, Barbara (2007): Effectiveness of Eccentric Exercises in the Management of Chronic Achilles Tendinosis. In The Internet Journal of Allied Health Sciences and Practice 5 (2). Available online at http://ijahsp.nova.edu/articles/vol5num2/van_Usen.pdf. Young, M. A. (2005): Eccentric decline squat protocol offers superior results at 12 months compared with traditional eccentric protocol for patellar tendinopathy in volleyball players. In British Journal of Sports Medicine 39 (2), pp. 102–105. DOI: 10.1136/bjsm.2003.010587.